How large should your stable or barn be? Much will be governed by your budget. Most horse’s and ponies don't need a barn as long as they have shelter from the wind, rain, and sun. But stables are convenient when working with your horse, keeping it clean for showing, during particularly icy or stormy weather, keeping it safe during times of stall rest or sickness, or when a broodmare foals. 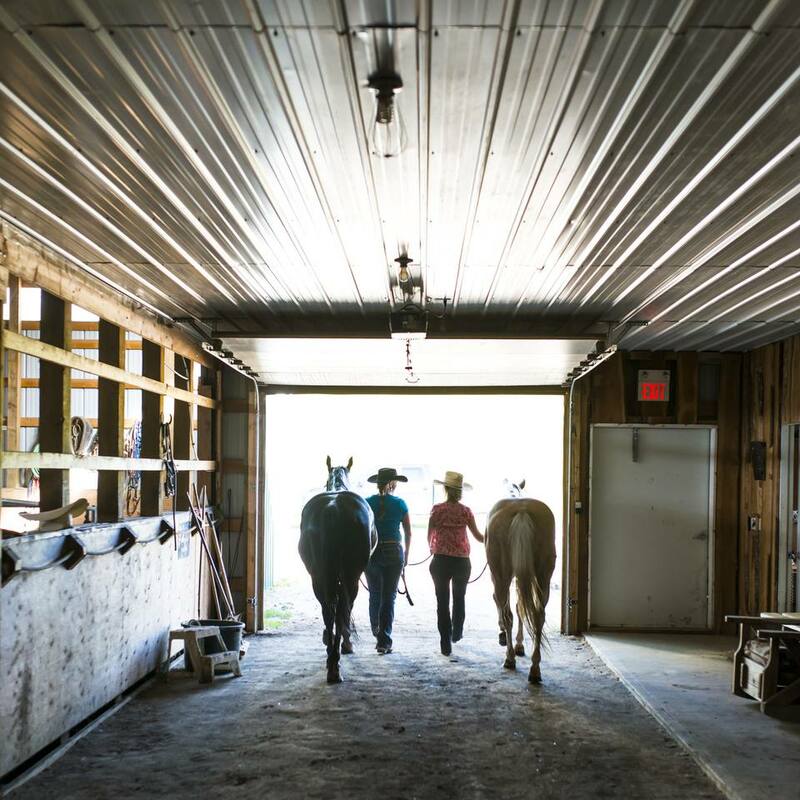 If you are planning to keep your horses in a barn, stalls need to be designed for the comfort, safety and health of the animal. And the size and layout of the barn needs to be safe and convenient for anyone handling horses in stalls and aisles. You will need space for equipment and feed storage in your barn. However, the most important part of your stable will be the stalls for your horses. Box stalls for a horse should be an average of twelve feet by twelve feet. A larger horse will be more comfortable in a larger stall, and a small pony will be happy in a somewhat smaller stall. Aisles will need to be designed so you can move any equipment easily. This includes getting things like tractors or horse-drawn vehicles around corners. You also don’t what tight quarters when you’re leading or working with horses . A space for grooming is handy, and if it’s in your budget, a wash stall for bathing horses should be as large as a box stall, or larger. Stalls for broodmares who will foal are often larger than a regular stall. The easiest way to accommodate a mare and foal is to make the partitions between two stalls removable so that the mom and babe can have a double stall. The two stalls can be returned to their original sizes and use once the foal has been weaned. A larger stall can also be useful for horses on stall rest. Standing stalls should be about five feet wide and eight feet deep. Again this depends on the size of the horse. Ponies can be put in shorter, narrower stalls. while 8’x5’ should be sufficient for the average riding horse. If you have draft or draft crosses, your standing stalls will need to be deeper and wider. Whatever size horse you have, there should be enough room to stand and lie down easily. If a manger for hay is built into the front, this will add to the depth of the stall. The tie rope should be positioned high enough that the horse cannot put a foreleg over it. Stall walls between the horses can go to the ceiling or maybe a bit lower so horses can see each other easily. Horses are happier if they feel they are with companions. Six feet high or higher ensures that horses can't get over, or caught up on the wall. Some people fill in the open space with metal bars or heavy square wire screen so horses can see, but not touch each other. Be sure that the spaces in the wire, or between the bars is small enough the horse can't get caught. If you will store tack in your stable, you’ll need to set aside space for this too. And extra box stall can be used, or a room can be built, perhaps incorporated into a feed room. In determining the size, think about the bending, lifting and carrying you’ll be doing and plan for a little extra space. If you will store horse-drawn vehicles in your stable, extra room will be needed. It’s not safe to keep carts and buggies in a way that means you’ll be leading horses around and through them when leading or grooming.